I don't know how many of you have been following this excellent series - but I have been absolutely hooked. Last week there was a story about one of the kings way back when - actually moving a river - because it didn't look right as it flowed past his country mansion! These are the small - very interesting - stories that have come out of this programme that I love. This week (tomorrow - Sunday 16th August - BBC1 - 9pm) - Griff Rhys-Jones travels from the source of the Lea in Leagrave Common, Luton to the Thames, stopping off at the heritage site in Waltham Abbey, now a popular attraction for families, on the way. He explores the role water played in the industrial revolution - and research and development processes in the gunpowder mills 300-year secret history. 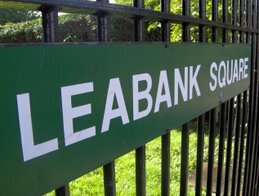 Of course - the actual River Lea is the one on the other side of Arena Fields (now on the Olympic site) - but I wonder if Griff will take a stroll down past Leabank Square? Even if he doesn't - I'm sure he'll come up with some amazing fact about our history that none of us knew before! I urge all of you to watch this amazing series - it's one of the best things the BBC has done! Thanks for this forwarning. It meant I couldn't pose for the Evening Standard photo, but tottally worth it. It would have been nicer if there was more about our side of the Olympic Park, but it was so interresting anyway. I wonder how many residents of Luton know that they are named after the River Lea? That was brilliant! I'm hooked! Please can we borrow your boat again sometime soon Dude, I want to see the Wick from the same vanatge point. Thanks for the heads-up. Please let everyone know if you hear about any other local-national crossover stories.